The mainstream media clearly isn’t going to fix itself. So I’ve decided to prove that the type of inclusive coverage they’re so vigorously resisting will produce literary criticism as good as what they’re doing—maybe even better, although that’s for readers to judge. I’m partnering with a new online media site called Beacon to create a book review column with a conscious agenda of upending the gender rations of mainstream literary coverage. 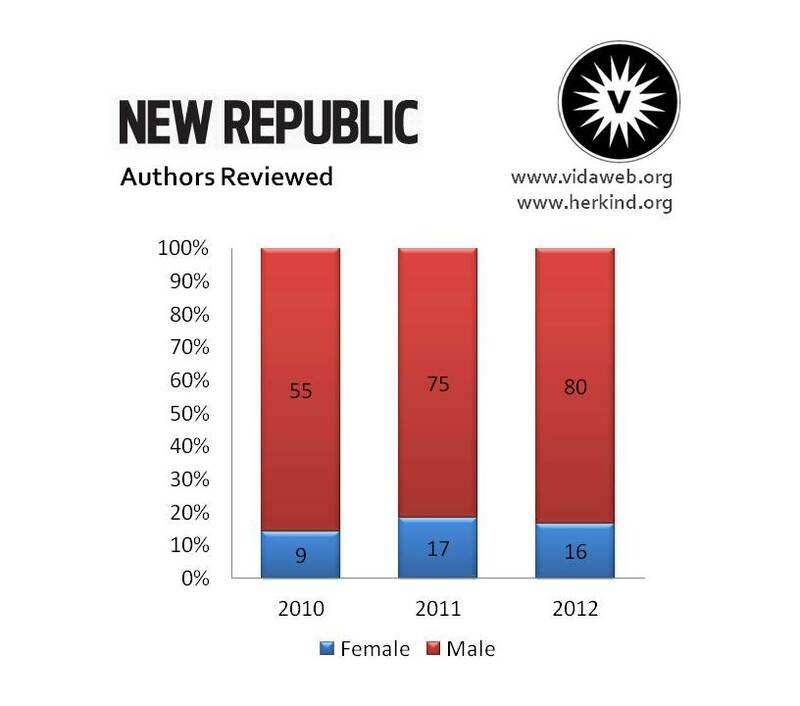 It’s not just going to be closer to 50-50 women and men; it’s probably going to feature more women writers. And, inspired by the model MSNBC host Chris Hayes uses to book guests for his show, I’ll also pay deliberate attention to covering writers of diverse ethnicities and sexual identities. The intended result, as I’ve been explaining it in conversations over the last week, is that with every 100 writers featured in my column, you might see 20 white men… 25 at most. I know the criticisms that will be raised against this approach. Two years ago, a staffer at The New Republic (not coincidentally home to one of the most imbalanced book review sections) deflected criticism by declaring, “Literary criticism can’t fall victim to numbers games. A review section should be a well-rounded meritocracy.” The obvious rejoinder is that review sections at TNR and elsewhere aren’t anywhere near as well-rounded as they could be, and if it takes deliberately, consciously keeping in the forefront of our minds the possibility that somebody besides a white man might write a book worth discussing and sharing with others, so be it. You see, I’m not interested in “fiction that really will endure.” I don’t even pretend to know what that is. What I’m interested in is books that have something interesting to say to me right now—ideally, not something that’s going to reinforce cultural biases that have guided mainstream literary criticism for years. I want to discover new writers, new voices… and I know I’m not the only one who feels that way. I’m in the middle of my first column now, and aiming to post it soon; in the meantime, though, if you want an idea of what sort of book reviewing you’d be getting for your $5 each month, see what I’ve written about Helene Wecker’s The Golem and the Jinni or Nathaniel Rich’s Odds Against Tomorrow. I know there are far more than 200 people who care about the state of contemporary book reviewing, though. People who want to read book coverage that’s more diverse, more inclusive than what they’re getting now. And I firmly believe that mainstream media outlets could deliver that coverage if they applied themselves to the task—but since that’s not happening, I’m ready to step up to the plate. I hope you’ll join me. I look forward to sharing the books I discover with you.